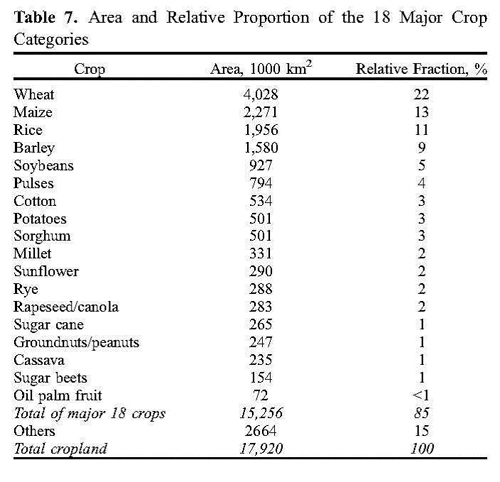 The most commonly cultivated plants besides the three wheat, corn and rice are shown in the table below. Rice comes in third place and is the largest crop in Asia. Rice harvest has increased substantially over the past 40 years. An example from Bangladesh. In 1971 they produced between 10 and 11 million tonnes of rice, now they produce about 25 million tons of rice on the same land. The population in the same period increased from 71 million to 135 million people. Yields have increased faster than the population. Those areas do not change much over all in Asia. Even Alfred Russel Wallace said 100 years ago about Bali that they grow on each cm2 and there is hardly any place for wild plants. Thailand plans to increase its rice areal with 500 000 ha while Japan has abandoned the same amount of land, land more difficult to cultivate. This abandoning of marginal and not very fertile agricultural land is a phenomenon not only in Asia. In Puerto Rico, the proportion of forest land increased from 28% to 40% of the country. The same trend in Nicaragua. Some countries in Africa are developing in the opposite direction as for example Zimbabwe. They lost 21% of their forests between 1990 and 2005. Something that reflects the anarchy in this country where the old, crazy man Mugabe reigns.